I started downloading then remembered I had to open up Origin to do so and now I'm not sure I can be arsed. 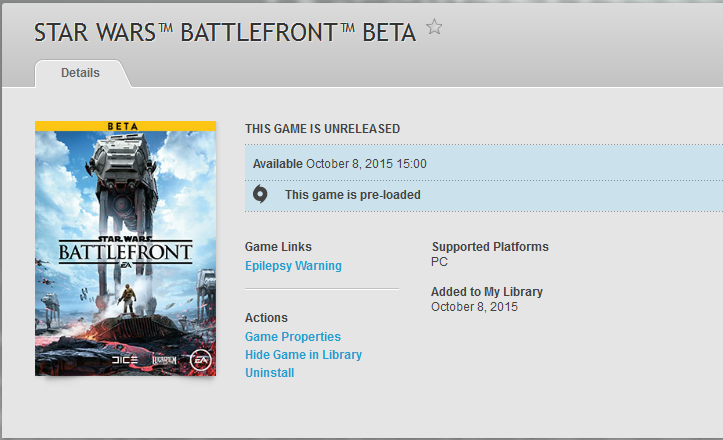 I like Star Wars but am less interested in BF since BF3. (10-08-2015, 10:36 PM)HooT Wrote: Is it any good? Judging by the footage and so on it looks like they did a lot of things right even though it looked grim at the start. I'll download it whilst I'm at work then. You'll like it Hoot. I'll be on after 6 tonight. You'll be pleasantly surprised at how well it can handle it. Yeh I've seen them. My graphics card is not up to it but somehow it worked and looked pretty good when I played briefly earlier today. Was a good laugh - only had a couple of quick goes though. agreed. Just a shame with regards to parties. Most likely due to Beta status - I'd expect that to be resolved before launch.